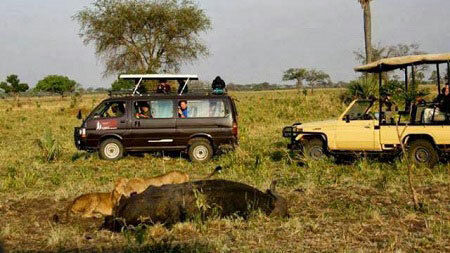 3 Days Lake Mburo Wildlife Safari. At Kjong Uganda Safaris we invite you to join us on what will be a very challenging but extremely rewarding hike in one of the world’s greatest ranges – the Rwenzori commonly known to outside world as The Mountains of the Moon. Rwenzori Mountain Climbing Uganda Safari will enable you climb Africa’s 3rd highest peak, hence enable you encounter several great scenery found with in the Rwenzori mountain ranges. As we start our Rwenzori Mountain Climbing Uganda Safari, you will be met by our staff at Entebbe Airport, who will warmly welcome you to Uganda then transfer you to your hotel for an overnight stay. He will brief you about Uganda and the highlights of your travel itinerary, hence let you prepare for your amazing Rwenzori Mountain Climbing experience. Having taken an early breakfast, we start our Rwenzori Mountain Climbing Uganda safari with a drive to Kasese through Fort portal and this will take us up to 10 hours of driving before we get to Rwenzori Mountain National Park in Kasese town. Along the way you will have the opportunity to view a variety of wonderful Landscapes, Tea Plantations, Forests, Birds and a Few Primates along the paved road. Later check in at the hotel. Day 3: Drive to Nyakalengija/Nyabitaba 2,632 meters high. After an early morning breakfast we start our Rwenzori Mountain Climbing Uganda Trip as we drive to Nyakalengija the starting point at Mount Rwenzori, you will be requested to hire climbing equipment in case you do not have, then settle for a short mountain climbing briefing, meet your porters and guides hence start the Rwenzori Mountain Climbing experience. Walk past Bakonzo mud and wattle homes, gardens and continue hiking till you reach the park boundary. Enjoy wonderful vegetation, elephant grass, red flowered erythrina abyssinica and flat crowned Alibizia. Climbing Africa’s 3rd highest peak will require you to cross the boundary through the montane forest vegetation following the Mubuku river, cross river Kyoho, Muhoma to start a steep climb to Nyabithaba through open broken farms of ferns till you reach Nyabithaba 3,632 meters high. On this hike you have a chance to see the Rwenzori Columbus blue monkey, velvet monkey, Rwenzori Turacco while Chimpanzees and forest Elephants are often heard than seen. The 4,627 meters Portal Peaks are reluctant to reveal themselves for a wonderful view, till you reach John Mathe hut. Day 4: Trail to John Mathe Hut, 3,415 m high. From Nyabithaba the trail will lead you slowly through black barriers as your eyes come in close range with the portal peaks hence making the mountain hiking safari in Uganda interesting and the trail will lead you to the Mubuku and Bujuku confluence crossed on the Kurt Shaffer floating bridge. Take on a steep gentle climb through the bamboo, hygenia trees, thick tangle of minulopsis Elliott, nettles and slowly reach the resting place to recover your breath. After a sip of water and chocolate start again to encounter the slippery boulders until you reach Nyamulegu hut 3000 meters high. Proceed on through heather, rapanea zone of groundsel trees, giant lobelias, everlasting helichrsum flowers and moss through moderate bogy areas to the nearest John Mathe hut for an overnight stay as we prepare for mountain hiking the next day. Rwenzori Mountain Climbing Uganda safari will enable you have an early morning start to hike through the most unique vegetation groundsel trees, giant lobelias, helichrsum flowers, and the chiefly curex that grow together to form a huge tussock of up to 1 meter high negotiating through the bogy area till you cross River Bujuku as you head to Bigo hut. Here we shall rest then proceed with our Rwenzori Mountain Climbing Uganda as we carry on through the groundsel trees and blanch barriers till the upper Bigo bog. Cross river Bujuku and climb gently through Alchamila, Senecio adnavalis rest as you view Stanley plateau with Margarita peak, Baker and the Bujuku valley till you reach Bigo hut. Have an early start through the Afro alpine moorland zone till you reach a steep sport with a metallic ladder. Climb it over, have a break to hold your breath and a sip of water as you experience Rwenzori Mountain Climbing Uganda Safari hence spot a view point for Mount Stanley and Mount Baker. From here you can either go straight to Lake Kitandara 4,372 m high or Elena hut 4,430 m high, the starting point to climbing Alexander and Margharita peaks on mount Stanley. The trail gently rises through Senecio trees and helichrysum flowers past Lake Kitandara and negotiate around the bogy area and continue to Kitandara hut 4,023 m high hence exploring Mountain Rwenzori National Park. Rwenzori Mountain Climbing tours through a steep climb in Rwenzori mountains will enable you reach the Fresh Field Pass, a lovely site view point to see the meandering River Semuliki taking its course to Lake Albert. The trail passes through over wet slippery fields of senecio trees and Tusocks till Bujongolo and Kaijongo rock shelters the well known base for Duke of Abruzzi expedition of 1906. Cross river Mubuku head to Kabamba rock to reach Guy Yeoman hut hence making Rwenzori Mountain Climbing Uganda Safaris amazing. The Rwenzori Mountain Climbing tour will commence with an early start as the trail from guy Yeoman hut is difficult associated with challenging descending of deep mud and slippery rocks these challenges make the entire trip of Rwenzori Mountain Climbing Uganda safari experiential, Walk through the bamboo forest and cross the upper river Mubuku to finish up the circuit. hence camp overnight. Descend to the Rwenzori Mountains National Park head quarters and finish your trip as you share a drink with your guides and porters as a sign of victory, hence drive back to your respective hotels with new stories and experiences as you mark an end to our Rwenzori Mountain Climbing Uganda trip. Day 10: Drive from Kasese to Kampala/Entebbe. As we mark an end towards our Rwenzori Mountain Climbing Uganda safari, you will drive from Kasese to Kampala hence proceed to Entebbe Airport to catch up with your flight back home baring in mind the experience of hiking Africa’s 3rd highest peak. Accommodation in Mountain huts and camps/Hotels. Porters 25 kg per person. Rescue fees in case of emergency rescue on Rwenzori Mountains. Extra Luggage (extra 25 kg per person). 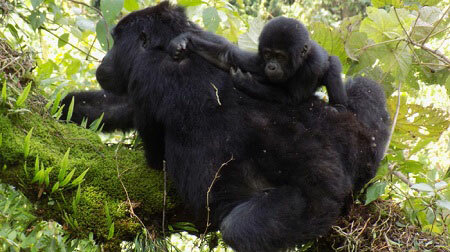 Any changes in the program itinerary while in the Rwenzori. Climbers must be prepared to walk for up to 8 hours every day via steep cliff and muddy paths. Climbers must bring along their own climbing gear or hire it at the base camp. Our porters carry 8 kg of personal climbing gear. Address: Green Leaves House, Kirombe-Butabika road, Kampala, Uganda.